Differential Scanning Calorimetry (DSC) is a thermal analysis technique which measures the amount of heat that is necessary to change the temperature of a sample (relative to a reference material). In this technique, the temperature of the sample is increased linearly, and the amount of heat required to maintain this temperature ramp is measured. This can be used to gain significant understanding of the thermal and thermo-dynamic properties of the materials under analysis. The simplest application of DSC is to measure heat capacity (or specific heat). This is a fundamental thermal property of a material or composite. Using laser flash, we can measure a material's thermal diffusivity. We can convert diffusivity to thermal conductivity using the formula: Thermal conductivity = Cp (heat capacity) * Thermal Diffusivity * Density. When materials undergo phase transitions, the material may absorb (endothermic transition) or emit heat (exothermic transition). These transitions show up as positive (exothermic) or negative (endothermic) heat flow peaks in a DSC scan. Examples of phase transition probed with DSC includes: melting, freezing, vaporizing, condensing, crystal structure changes, and glass transitions. The DSC peak allows identification of the phase transition type, onset temperature and peak width. As discussed below, DSC can be used to measure heat capacity Cp, a critical component in thermal conductivity measurements. This is much more accurate than using the laser flash equipment to estimate Cp. The glass transition temperature of a polymer can be measured which is key to understanding mechanical and thermal expansion properties. The shape of a melting curve can be measured. This is a critical property of understanding solder behavior. Solder melt and then dissolve adjacent metal forming intermetallic compounds. Both the melting and reaction of the solder with metallization can be analyzed in a DSC as a function of temperature to help design optimum solder re-flow profiles (for a specific metallization). Samples can be tested at temperatures from -40°C to 350°C in either an air, nitrogen, or argon enviroment. All DSC runs are calibrated agaisnt the following NIST Standards. Specific Heat Capacity (Cp) is the amount of heat required to raise the temperature of one gram of a particular material one kelvin of temperature. Specific Heat Capacity is due to the molecular motion in a material (units of J/g K).Heat capacity is the amount of heat required to raise the temperature of a material one kelvin of temperature. This is unnormalized specific heat (units of J/K).Specific heat is the specific heat capacity of an analyte compared to the specific heat capacity of a reference material (dimensionless). Crystalline polymers contain more order and thus fewer degrees of molecular motion. Less molecular motion results in lower specific heat capacity. 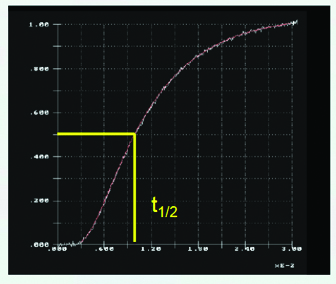 Changes in heat capacity as revealed from a DSC curve gives information about phase changes.